This is my favorite time of year. The flowers are blooming and birthday season has sprung (in my family we have myself, my Aunt, my husband, three of our 6 kids and many more people - whew!)! 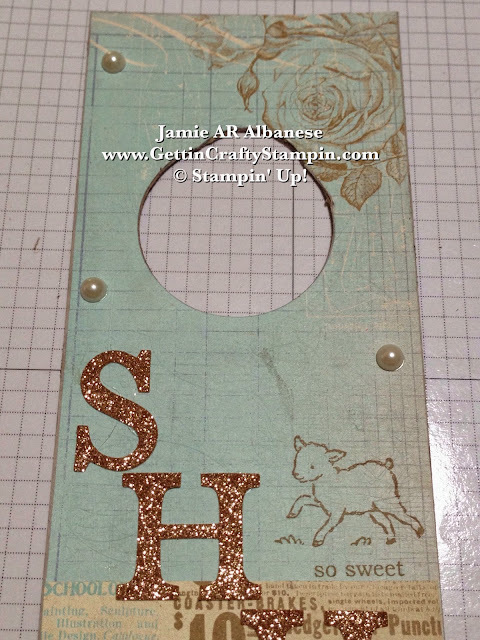 I love when babies are born in Spring as creating baby projects, like this Vintage Door Hanger, inspires me to use sweet lambs, bunnies and more. Say 'Hello' to a newborn while you don't have to say 'Good-Bye' to your favorite stamps and accessories! *Grab YOUR Fun Last Chance Items and with FREE SHIPPING (April 21-25). 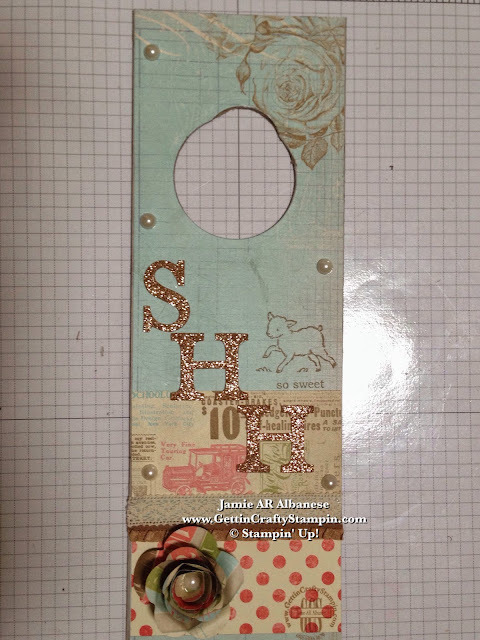 Celebrate all the new life with me, create a pretty door hanger as a great gift (or to decorate your own home)! OK so I have a stack of these backs from my Designer Series Papers. This is the cardboard/chipboard that is in the back of the paper. I have a handy stack that I use for various reasons - some thicker than others, but all thicker than our card stock. Cutting this 12" piece into 4" lengths with my Rotary Stampin' Trimmer (#126889 cutter / 129407 rotary). This piece is a thicker heavy chipboard. Use the Circles Framelits to punch this door knob hole. Due to it's being extra thick, I had to flip it over and follow the impression from the front to cut from the back - so it took two times through my Big Shot. 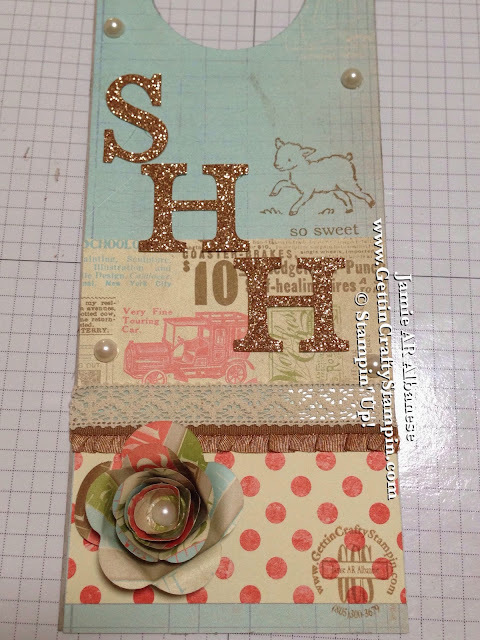 I adore this vintage *Etcetera Designer Series Paper. 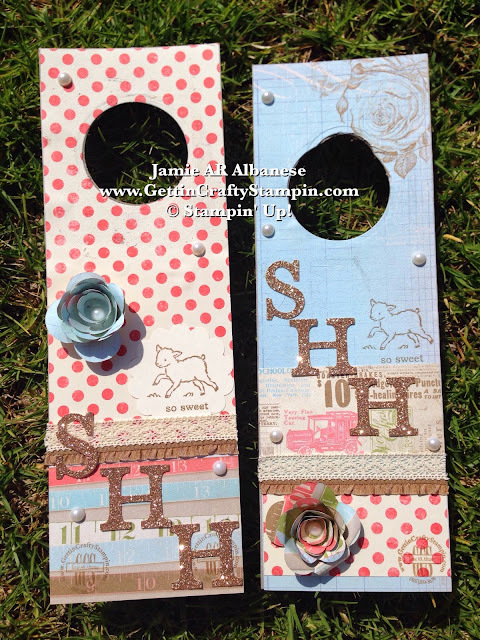 With a beautiful collection that is fun to mix up patterns, you can create a variety of beautiful images. 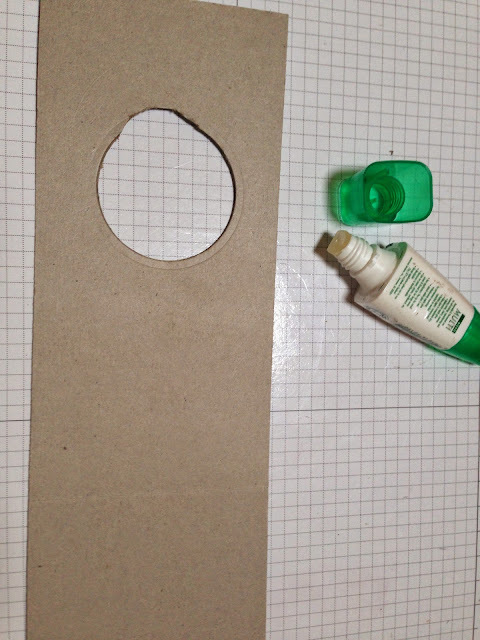 Adhere to the Chipboard with the broad tip on the Multipurpose Liquid adhesive. Apply this beautiful *Victoria Crochet Trim and *Ruffled Baked Brown Sugar Trim with the Sticky Strip adhesive. 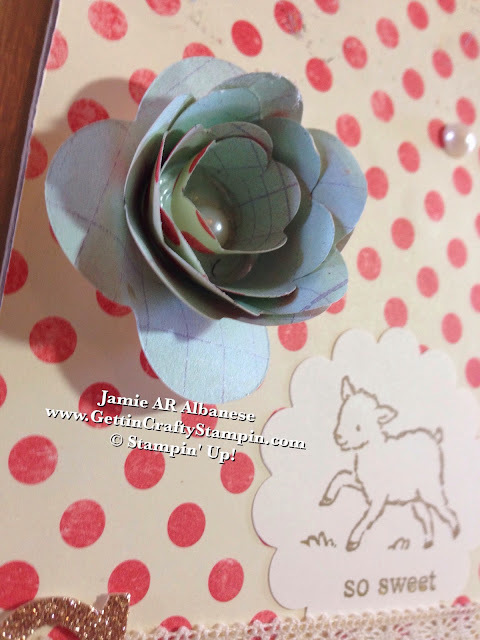 Stamping this vintage lamb from the *Storybook Friends stamp set with the Baked Brown Sugar ink for a Spring accent. I even 'signed' this project with my Say It Your Way stamp... it's a fun addition that, like an artist, is a signature. Using the *Etcetra paper to create this cool rose with the Spiral Flower Die from the Occasions Mini. 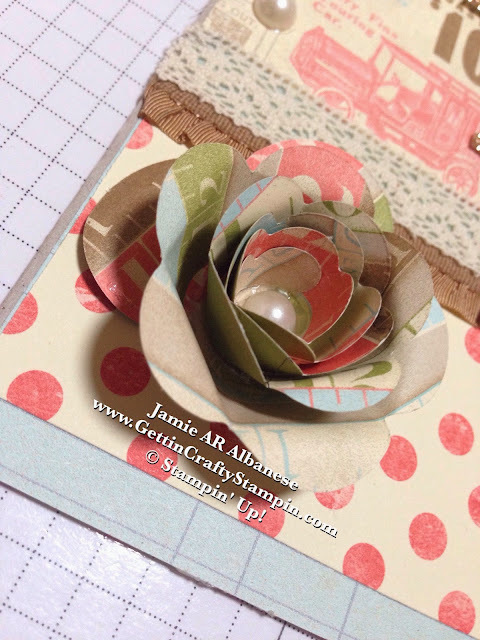 Adhere it with your Hot Glue and apply the adhesive backed *Large Pearl Jewels for an elegant accent in the center of this mixed media rose. Using the *Typeset Alphabet Dies to create what ever you want said. Here the Champagne Glimmer paper is a beautiful way to say 'Shhhhh'. Option... 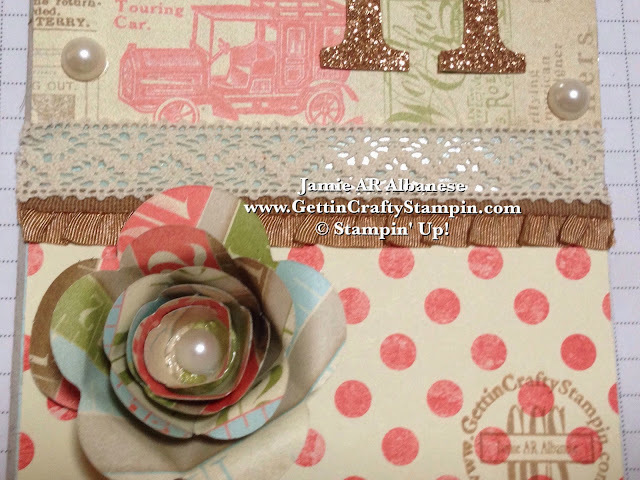 Here are two ways to use this stunning vintage *Etcetera Designer Series Paper. Which do YOU prefer?? Leave me a comment and let me know. I'm so excited for my girlfriend Callie who has been blessed with a wonderful pregnancy and is delivering her baby girl tomorrow. My other girlfriend Susan is expecting her first granddaughter and I couldn't resist creating these to celebrate the babies!! The same packet of paper, this *Etcetera has a wonderful collection of beautiful patterns that are fun to mix and match. 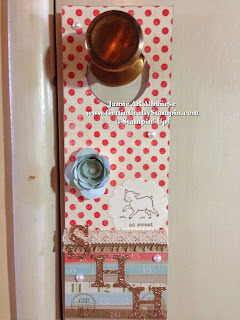 Applying the adhesive backed *Large Pearl Jewels about this Vintage Door Hanger is a subtle but pretty elegant accent. 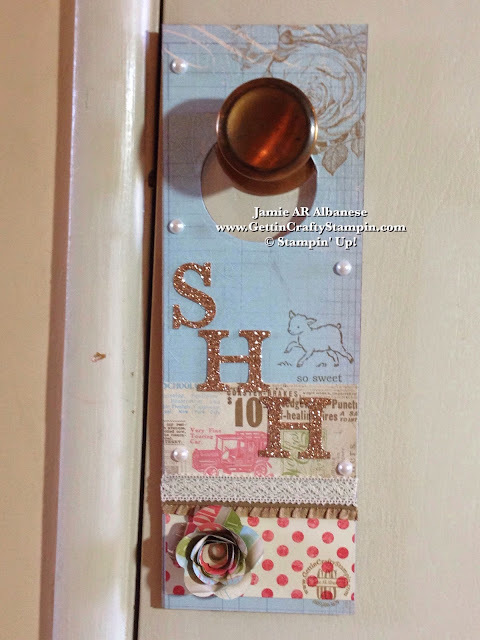 What a fun way to decorate your home... and with our large variety of papers, you can have fun personalizing door hangers for holidays or personal style. 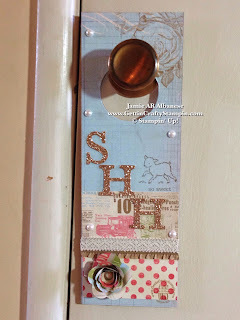 As a mom of six, one who regularly receives visitors of my friends, neighbors and delivery people... having a door knocker like this is a great way to ask for some quiet. 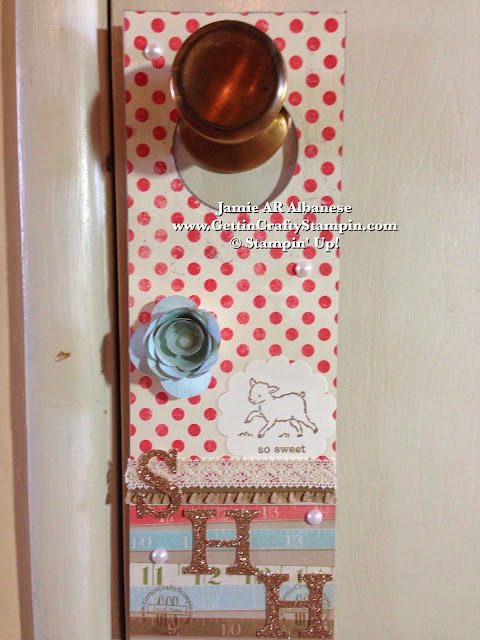 (As in, don't ring my door bell, getting my older kids and dog all excited for the door, lol... let that baby sleep!!) 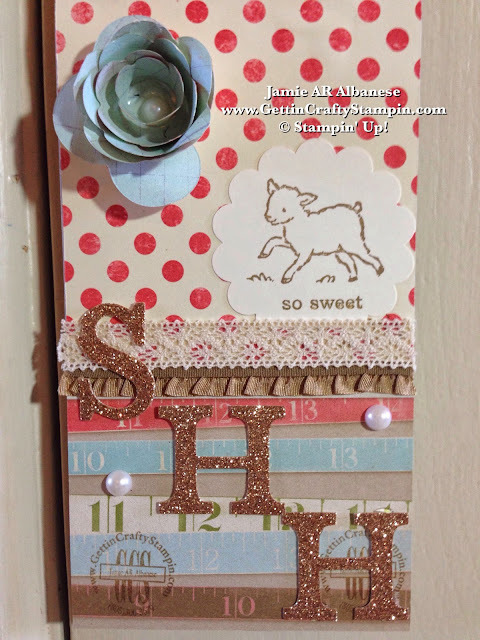 Say 'Hello' to those new babies in your life... and don't say 'Good-Bye' to these beautiful and timeless tools, stamps, ribbons and papers... they are priceless (but will go fast - grab YOURS while there is FREE Shipping and take my Spring into Cards class for FREE).